00:40:00 Makes 6 servings, 1 chicken bundle (151 g) each. Makes 6 servings, 1 chicken bundle (151 g) each. 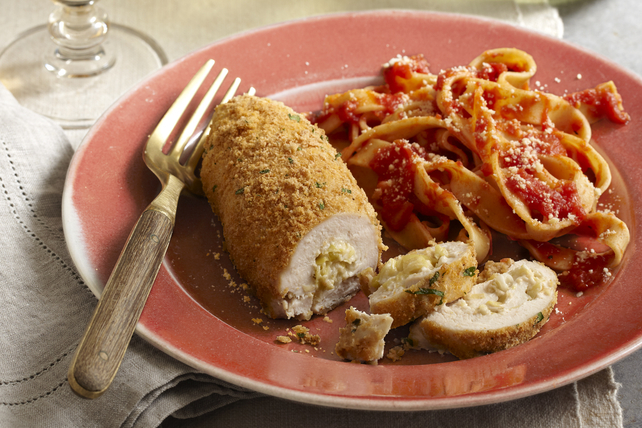 Crispy chicken wrapped around Parmesan cheese, artichokes and onions? Nothing to it. With just 15 minutes of prep, you'll have a delicious oven-baked chicken dish on the table that they won't believe. Place chicken, smooth-sides down, on work surface. Mix next 4 ingredients; spread onto breasts, leaving 1/4-inch border around each edge. Starting at 1 short end of each breast, roll up chicken tightly. Secure with wooden toothpicks, if desired. Beat egg in pie plate. Mix remaining ingredients in separate pie plate. Dip chicken bundles, 1 at a time, in egg, then roll in coating mixture. Place, seam-sides down, in single layer in shallow foil-lined pan sprayed with cooking spray, folding under ends of each chicken bundle to completely enclose filling. Serve with hot cooked fettuccine tossed with your favourite pasta sauce topped with Kraft 100% Parmesan Grated Cheese. Refrigerate the leftover artichokes. Chop, then add to your favourite salad or sandwich filling. If using chicken breasts larger than 1/2 lb./225 g each, cut each breast horizontally in half before using as directed. Serving Size Makes 6 servings, 1 chicken bundle (151 g) each.